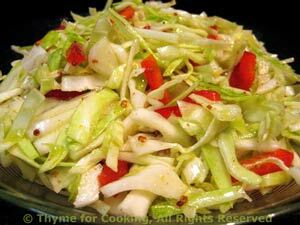 Tangy Cabbage Salad with non-traditional, sweet and sour dressing. Put cabbage and pepper into a large bowl. Add half of the dressing and toss well to combine. Add more dressing according to taste and the amount of cabbage. Put all of the ingredients in a medium bowl, Using as large a whisk as you have (and is reasonable), vigorously whisk ingredients together. The sugar will dissolve and the dressing get quite thick and clear. There are 240 calories and 17 carbs in the cabbage/pepper.